Kodak i1860 Scanner The KODAK i1860 Scanner gives you optimal productivity, starting with 200 pages per minute of real throughput—not just raw speed. 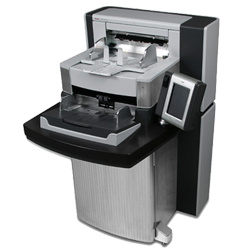 Its features and benefits lead to productivity gains all the way through your scanning process. The i1860 is easy to use and durable enough to work through multiple shifts, day after day. And it adds ergonomic correctness to your scanning operation. Add in great value, and the KODAK i1860 is everything you want in a high-speed, high-volume scanner. Perfect Page image processing gives you clear, sharp images automatically and at full speed. Sure Path paper handling lets you easily scan a wide range of document types and sizes. Height-adjustable transport provides a customized scanning position for every operator. Color touch screen is easy to use and adjustable for your convenience. Patch reading, indexing, image addressing and imprinting make managing documents easy. Environmentally friendly: lead-free, Energy Star qualified, mercury-free illumination lamps. Flexible, 500-sheet feeder capacity optimizes paper handling. Color touch screen provides operating convenience. Automatic color detection to reduce document prep time and help automate scannin. Automatic orientation—based on a document’s content, automatically delivers the scanned image in its proper reading orientation.